The Roads and Transport Authority (RTA) has launched the trial run of its 'bus on demand' initiative in Al Warqaa and Al Barsha. For three months, the service will be free, the authority announced on Saturday. It is offered through the MVMANT app. 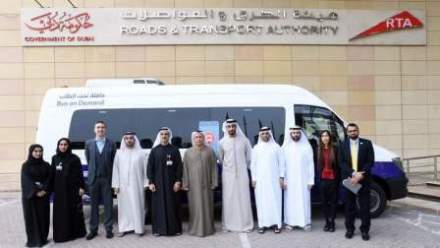 Ahmed Bahrozyan, CEO of the RTA's public transport agency, said: "The 18-seater buses will operate on flexible routes and schedules, and bus drivers can know the service demand through the app to reach to the nearest point to their destinations. Through the MVMANT app, customers living in Al Warqaa and Al Barsha will be able to identify their locations and track the bus arrival times to their locations." The smart responsive system is based on the idea of linking some places with mini public buses operating near the locations of commuters. "They can avail the service through the smart app, which enables them to figure out their routes from the start point to destination point, choose their preferred seats, and pay fares. The service will be an innovative solution to the first and last mile between the homes of clients and the nearest public transport station," added Bahrozyan. During the trial period, the RTA will assess the efficiency of the service in terms of accessibility to riders, response period, and the time of journey to the destination. A questionnaire will be provided at the Metro stations in Al Warqaa and Al Barsha to understand commuters' "needs, views and thoughts". Khalfan Belhoul, chief executive officer of the Dubai Future Foundation, said: "The solutions that the MVMANT's bus on demand service brings to the table will help reinvent the transportation sector on the one hand, while bringing benefits to the economy as a whole." Before the launch of this initiative, the RTA had conducted site surveys and polls covering 1,750 commuters (63 per cent males and the rest females). The proportion of those aged 25 to 34 amounted to 53 per cent. The service targets three categories: Workers (23 per cent), occupational specialists (15 per cent), and retail and services business (62 per cent). According to the RTA, the site survey was based on several parameters, including demography of service users, car ownership, mobility options, nearest public transport station/stops, and preferred mobility choices such as the walking distance, waiting time etc. Other parameters included comfort, accuracy of schedules, and service on demand, service proximity to homes and destinations, and reasonable fares of the service.